This is simply too good not to share. 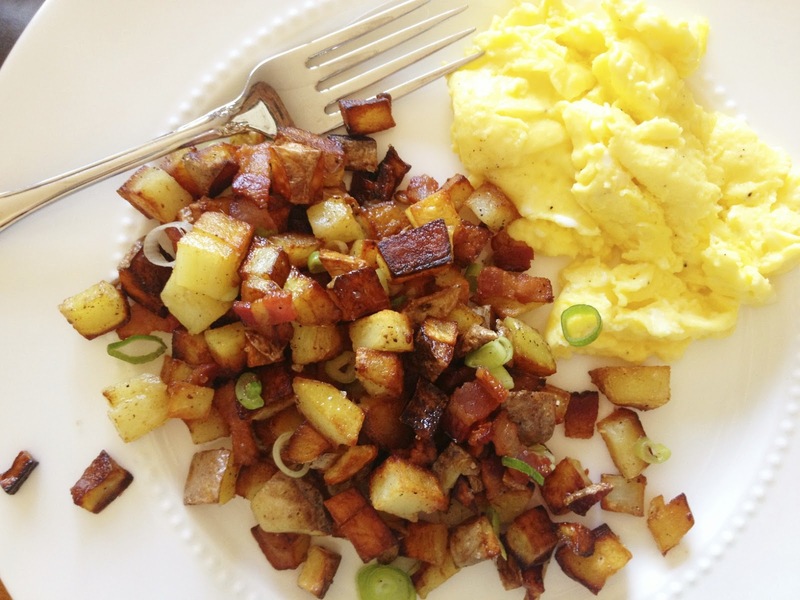 I came across this recipe on Amateur Gourmet last week and it has changed my breakfast life. Because I have tried to make hashbrowns OH SO MANY TIMES. Using various types of potatoes, adding in onions and peppers. Frying on various heat levels, in butter, oil, or both. I've tried recipes from otherwise totally legitimate cookbooks. And I have failed every time. Mistake number one is trying to make hash browns rather than country potatoes or whatever the alternative to hash browns are called. It's not worth the time and effort. Grating the potatoes, then squeezing the liquid out of them? What a mess and a hassle. Forget about it. They will never turn out right. But this? Oh, man. I should have known all along the secret miracle-ingredient would be bacon fat. It's such a simple recipe, you'll basically memorize it right off the bat. The only way my recipe differs from the Amateur Gourmet version is that I used yukon gold potatoes instead of russet (only because I couldn't find organic russet potatoes and potatoes are one of those things you're supposed to try to eat the organic version of. But the yukon were really delicious), and I learned you should salt them only once. Don't over salt. I liked these oh-so-much that I made them twice last weekend. I may make them again this weekend. This will definitely be one of those staple recipes I turn to repeatedly. I hope you try it and it blows your mind, too. Slice the bacon into strips and fry in a large cast-iron skillet. While it's frying up, wash your potato(es) and pat dry with a paper towel. Cut it up into half-inch cubes. Remove the bacon from the skillet when it's cooked (I drain it on a paper towel), and turn up the heat to medium-high. Your bacon grease will be smoking. Then add the potatoes and arrange them in a single layer. Salt and pepper them and let sit for about three minutes. Then turn them with a spatula, and let sit for another three minutes. If your skillet dries out, add some canola oil. So on and so forth until they look and taste finished. Season to taste, if necessary. Add the bacon and scallion, if using, and serve immediately. I'm sold. In fact, in my imagination I'm already eating it.